One of the worst non-fatal injuries that can be sustained in a car accident is a traumatic brain injury (TBI). A TBI occurs when a sudden trauma causes damage to your brain. 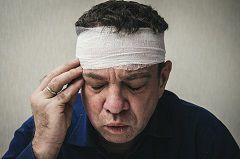 This can be the result of a sudden blow to the head, either striking or being struck by an object, or when an object pierces the skull and enters the brain tissue. Even a minor TBI can cause irreversible brain damage and affect not only the injured but all who care about him as well. According to the Center for Disease Control and Prevention, about two million Americans per year suffer a TBI, with 14 percent caused by traffic accidents. This means that some 286,000 vehicle collisions result in some sort of TBI every single year. Concussions. A concussion is caused when the brain is traumatized from an impact or a sudden violent movement. As a result of the force exerted on it, the brain can shift and collide into the inner skull. This collision can then cause blood vessels to stretch and cranial nerves to become damaged. Concussions are the most common type of TBI and can be caused by a variety of traumas, the more severe of which can lead to intracranial bleeding (bleeding inside the brain) and permanent brain damage. Contusions. A contusion is a bruise (bleeding) on the brain that can cause swelling, blood clots, and anoxia (lack of oxygen to the brain). Car accident contusions generally result from severe impact blows to the head. Coup-contrecoup. Coup-contrecoup injuries are contusions that are present at both the site of the impact as well as on the complete opposite side of the brain. These injuries occur when the force impacting the head is not only great enough to cause a contusion at the site of impact but also strong enough to slam the brain into the opposite side of the skull, which causes the additional contusion. Diffuse axonal injuries. Diffuse axonal injuries refer to tears in the nerves of the brain. During an accident, a victim’s skull can be violently forced in different directions. If the skull moves faster than the brain, the force of the pitch can cause tissues, nerves, and stability structures in the skull to shear and tear away from the unmoving brain. This disturbance can produce temporary or permanent widespread brain damage, coma, or even death. Symptoms of traumatic brain injury can range from light to severe, depending on the seriousness of the accident. If you have been in a car crash and hit your head, make sure to tell someone about your injury, even if you don’t have any symptoms of head trauma. Not all TBIs are easily recognizable and can take weeks for symptoms to surface. Diagnose. Once a patient is stabilized, further testing either by x-ray or CT scan will determine if any other related injuries are present. Test. When a doctor suspects intracranial damage, an imaging test will be ordered to see the extent of the trauma to the brain. Treat. Depending on the type of damage involved, treatment can range from physical, occupational and speech/language therapy to psychiatry and social support to surgery. In order for the best treatment outcomes, it is crucial that you seek medical attention immediately if you experience any of the symptoms listed above. The longer you wait, the more damaged your brain can become and the less effective treatments will be. Treatment for a traumatic brain injury can involve costly therapy and long-term expenses. The financial loss to you and your family can be just as devastating as the injury itself…but there is hope. If you or a loved one has suffered a TBI as a result of a car collision, you need the professional guidance and support of an experienced brain injury lawyer. Contact us today at 713-921-4171 or 1-800-232-3711 to talk about your options for filing a personal injury claim. Help is available 24 hours a day and the initial consultation is always FREE. We can help you get the justice and peace of mind you and your family deserve. Call now!